Welcome to Day 27 of my #100DaysofBulletJournalIdeas Project! Now that we've talked about keeping a Wishlist for the things you'd like, which will also make it easier to pass ideas off to those who want to get you presents, here's an idea for a Gift List. Gift lists are pretty self-explanatory, they are a simple little log to write down ideas you want to grab for others. Now when their Birthday, Christmas, or a random time such as when they're feeling down rolls around, you can surprise them with a little pick-me-up. As you can see in this list, I did a little ^ up arrow symbol that means that the gift idea is for the person the arrow is pointing to. With this list, I started on the For column, then moved on to listing out some ideas, then I moved from right to left on the 4 symbols to the right (bought, card made, wrapped, done). 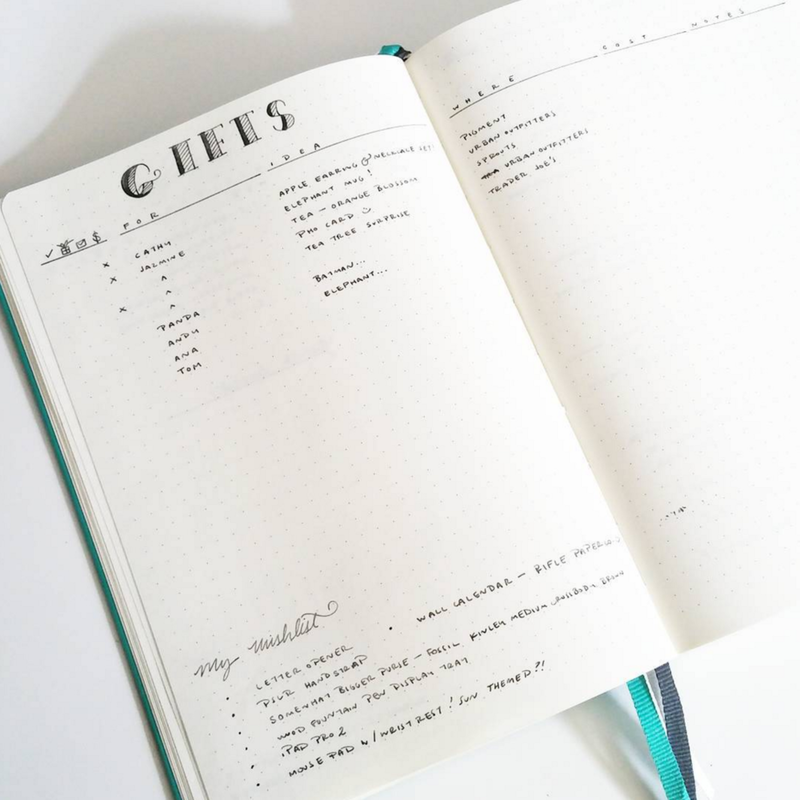 I find this idea to be extra handy when holidays roll around, I used this particular list last Christmas and it was super helpful! A Gift List can also be much simpler. You can also simply write or draw present ideas and point the name to all the different gift ideas. It's really up to you.